Ours is an age of historically unprecedented state and corporate surveillance. Our society’s growing addiction to social media, smart phones and other forms of digital communication has ushered in a more interconnected society, but one that is almost entirely dependent on the technological infrastructure of massive telecommunication, software and IT corporations. The rise of surveillance capitalism has also granted state intelligence networks like the NSA with an unfathomably intimate snapshot into our personal lives. These days, everything we do or say online is collected and stored in massive server farms, accessible to intelligence analysts and state security forces at any time of their choosing. 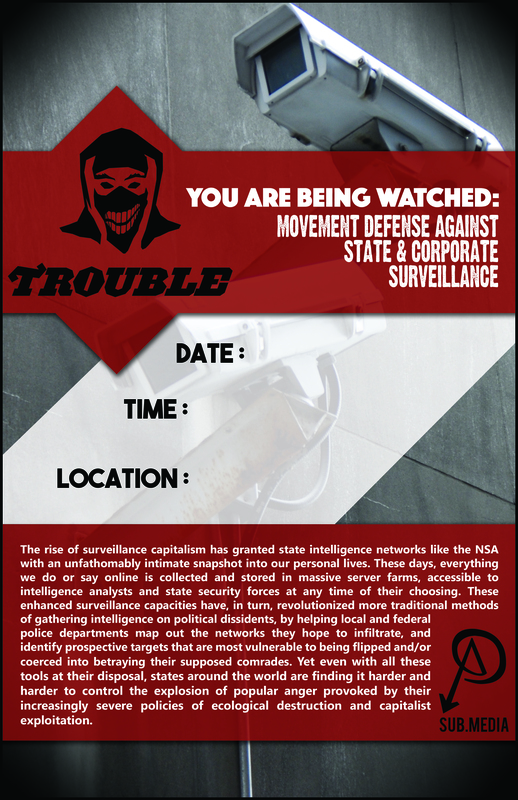 These enhanced surveillance capacities have, in turn, revolutionized more traditional methods of gathering intelligence on political dissidents, by helping local and federal police departments map out the networks they hope to infiltrate, and identify prospective targets that are most vulnerable to being flipped and/or coerced into betraying their supposed comrades. Yet even with all these tools at their disposal, states around the world are finding it harder and harder to control the explosion of popular anger provoked by their increasingly severe policies of ecological destruction and capitalist exploitation. In this month’s episode of Trouble, anarchist media collective sub.Media interviews a number of individuals about their experiences of dealing with undercovers and informants, and looks at some of the ways that we can build movements that are more resilient to state and corporate surveillance. This episode of Trouble features an interview with Lauren Regan of the Civil Liberties Defence Center. Part of this interview was used for a segment on the so-called Green Scare defendants, members of ELF cells who were arrested and prosecuted as part of the FBI’s Operation Backfire. It has since been brought to our attention that one of the co-defendants featured in this segment, Nathan “Exile” Block, is now an adherent of third-positionism and occult fascism. We have also learned that his partner, and co-defendant, Joyanna “Sadie” Zacher, who was also featured in the segment, has a history of making racist comments, and has publicly defended Exile’s views on white separatism. Neither Lauren, nor other members of subMedia were aware of this information at the time of the interview, or the release of the video, and we certainly do not share or condone their beliefs. There is a lurid history of fascist ideology mixing with radical environmentalism, extending from the “Blood and Soil” ideological wing of the Nazis, to the critiques of capitalism’s destructive ecological effects embedded within contemporary third-positionist ideologies. This is a threat that anarchists need to be vigilant about exposing and confronting. The reference to Exile and Sadie was made within the context of their refusal to accept plea deals or snitch on their co-defendants, despite facing the prospect of long prison sentences. While this practice of principled non-cooperation is something we obviously still support, it was not our intention to minimize or rationalize Exile’s current fascist beliefs by portraying he and Sadie in a positive light. SubMedia would like to thank the individuals who brought this information to our attention, and would like to refer those seeking additional information to the following article, published by NYC Antifa.